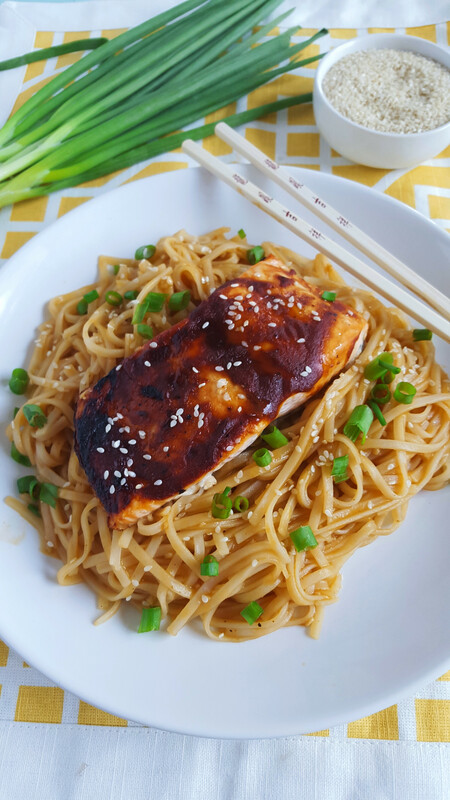 This recipe for BBQ Salmon & Sesame Noodles can be made in under 20 minutes for quick weeknight meal! 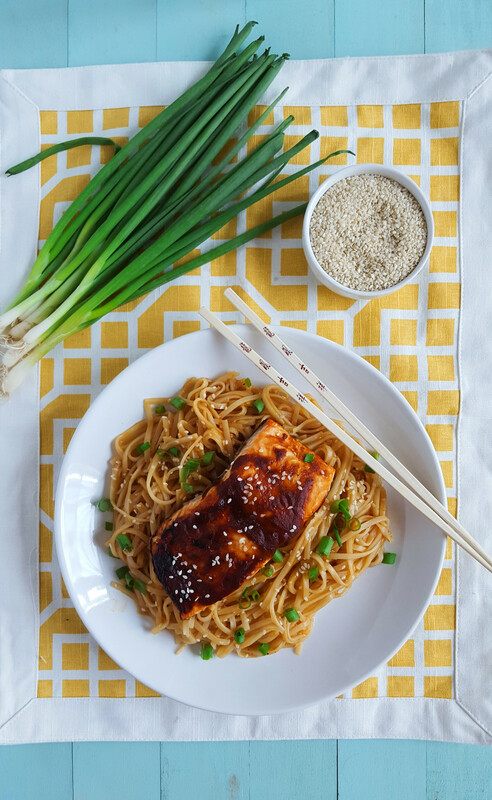 Salmon is brushed with BBQ sauce, broiled, and served with stir-fry noodles tossed in a sesame sauce. Last Friday, I spent the day working off-campus. I’ve been working with the marketing department at the heart hospital I work at to create a set of video blogs! We’re making ten of them, and the’re all less than two minutes long about various heart healthy and low sodium topics. We filmed at the home of one of the marketing gals who had a very nice kitchen. I was in charge of writing all ten scripts and coming up with the visual displays and food demos for each video. It took about 4 hours (surprisingly) to film everything. That was my first time using a teleprompter. It was a strange feeling, reading from a screen five feet away! I felt kind of weird standing there talking to the camera, haha. Yesterday I saw a first rough draft of the video. It’s weird hearing and seeing yourself talk on video. Anyone else feel this way? Since I was in charge of all the food displays and cooking demos for the vlogs, I got to buy a ton of fresh fruit and veggies, fresh meat, seafood and grains to put on display. I was very careful to try to keep everything refrigerated so the food wouldn’t go to waste. I got to keep most of the food afterwards which was nice– it was like a mini shopping trip! This past Saturday, Nick had a guy’s night out so it was just me and Link at home. I decided to use the salmon I had from the demo (Link likes salmon too). I love BBQ glazed salmon so I brushed some of my favorite BBQ sauce (I like Stubb’s– less processed ingredients) onto a filet and let it broil in the toaster oven. The only starch I had in the kitchen to pair was some leftover stir fry noodles (from my Pad Thai recipe) so I cooked those up and tossed with a simple sesame sauce. I wasn’t sure how BBQ would go with sesame but it WORKS! Totally works. It’s delicious. I posted a photo on IG of this recipe Saturday night and on Sunday I decided to remake it so I could take some pictures for the blog. The tanginess of the BBQ sauce works really well with the savory sesame oil, tart rice vinegar and salty soy sauce. Brush the salmon filets with the BBQ sauce. Season with a few dashes of soy. Broil for 4 to 6 minutes per half-inch of thickness, until the internal temperature reaches 145 degrees F.
Cook the stir fry noodles according to package direction. Drain and set aside. In a small sauce pan over medium heat, add the soy sauce, rice vinegar, sesame oil, Sriracha, garlic, and BBQ sauce. Bring to a soft boil. In a small bowl, whisk together the water and cornstarch. Pour slowly into the sauce. Cook for 2-3 minutes until thick. Toss the noodles with the sauce. Add salmon filet on top and garnish with green onion and sesame seeds! I’ll be sure to share them when they’re available! Yeah it’s a great combo!! If you try it let me know! :-O You’ve got to try BBQ salmon pronto!! It’s always my go-to sauce for salmon. So good.